Have you ever felt like something I’ve discussed on this show didn’t apply to you or your life? If so, then this is the episode for you. Today, I’ll explain how whatever I am teaching in any specific episode can be applied to your life in some way, and how assuming a certain topic is inapplicable to you can close your mind off to staying focused, paying attention and absorbing the information. I’ll share the necessary steps for ensuring that you are getting the absolute most out of this podcast. Listen in if you’re finished with making excuses and are prepared to let me help you finally keep that weight off! Reasons you should come to my podcast live event. How to get the most out of listening to this podcast. What is actually important in losing the weight. The steps you need to take to apply this podcast to your life. How to create your intention before you start listening to the podcast. How you can take actionable steps moving forward on this issue. What you can do to absorb the information I give you. 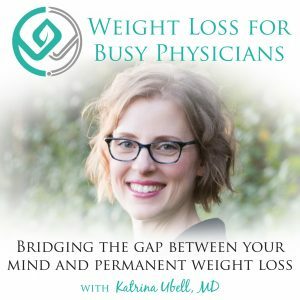 Katrina Ubell: You are listening to the Weight Loss for Busy Physicians podcast, with Katrina Ubell, M.D., episode number 117. 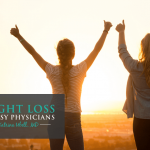 Welcome to Weight Loss for Busy Physicians, the podcast where busy doctors like you get the practical solutions and support you need to permanently lose the weight, so you can feel better, and have the life you want. If you’re looking to overcome your stress eating and exhaustion, and move into freedom around food, you’re in the right place. Hey friend, how are you? Welcome to the podcast. So excited to have you here today, thank you so much for being here, how are you doing? I am awesome, it is a beautiful, sunny spring day here, which in Wisconsin, we are into that. It feels amazing, I love it so much. My oldest son, who is 13, is in Japan with my mother on a three week trip. They’re almost a week into the trip, and he’s having the best time. It’s so fun to be able to just text back and forth. The time change is so big that we’re just waking up, and they’re going to bed, and all of that, but so fun to see all the pictures, and they’re there during the cherry blossom time, which is just amazing. And isn’t it so fun when your kids get to have an opportunity that you’re so excited for them about? Like, I wanna go too, but I’m so much more excited for him to have the experience, than for me to someday go. Yeah, sure, maybe someday I’ll go, but for him I just know it’s gonna be such a long lasting, lifetime experience for him, I just think it’s so amazing. So, super excited for him. So, listen, before I get started talking to you about the main thing I wanna talk to you about today, I wanna just let you know that tickets for my live event, podcast live, are on sale but only through today. So, today is the last day that you can purchase tickets, so I wanna just review with you why you should be coming, okay? So you should come if you’re tired of hiding your body in baggy, oversized clothes. You know, the pulling your shirt up thing, the little trick to hide your belly, you know what I mean? Like, buying all the tenty things. If you’re tired of avoiding the beach, and the pool, because wearing a swimsuit is absolutely the worst part of the summer, or you get on the swimsuit but then you’ve got the gigantic T-shirt on to kind of cover you up, and you just feel so miserable, you’re trying to get other people to get in the water for you. You’re the one, “No, I’ll just take the pictures, I’ll take the video,” right, you’re just so tired of not actually being a part of your life. If you’re tired of refusing to be photographed in your family pictures because you can’t stand the sight of yourself, if you’re tired of constantly readjusting that waistband, cover up your belly roll, you know, you’re just so tired of that. If you’re tired of wishing that you could wear your white coat all the time, because it hides your muffin top so well, or minimizes your rear end. Or if you are just tired of feeling stuck with your weight, and just tired of constantly either being on some sort of diet trying to lose weight, or beating yourself up about how you’re too heavy, and you should be trying to lose weight, all of those reasons and so many more are why you should come to this one day that we’re gonna have together. We’re gonna make more progress than you could ever imagine on your weight and your life in this one day. I think a lot of people start thinking, “Well, what can you even accomplish in a day?” So much more. Please, come, so that you can experience it for yourself. We’re going to focus on what is actually important to lose the weight, which is all of the mind work, instead of what most people are wasting all their time on, which is focusing on the food. Sure, you have to think about it a little bit, but that is not the main part. That’s not the most important part, and that’s why so few people have success with long-term weight loss. And I wanna just make it clear that this is not going to be a repeat of what I’ve taught you on this podcast. It’s also not a repeat of what I teach my clients, this is all new and all fresh. So you will go home knowing how to stop focusing on all that nonsense that just keeps you over eating and stuck in your overweight body. All the nonsense that everybody thinks is important, that really isn’t important. You will know how to lose your weight for that one last time, like really how to get it off, and how to become one of those very few people who keep it off forever. And, you will know exactly how to approach the unique struggles that come up for physicians that make losing weight and keeping it off on a day to day basis so challenging. So, I just wanna point out that it’s really easy to consume information, like this podcast, even if it really resonates with you, and not make lasting strides toward your weight loss goals. Many people will say to me, “I listen to your podcast, and things are so much better at work, and my relationships are better, my marriage is better, and I’ve lost maybe a couple pounds, but I haven’t really done the weight loss work, but I’m gonna get there,” right, because you’re not really taking the steps toward doing what’s required. But together we will take what I’ve taught you here on this podcast, plus more, and apply it to you. Your unique life, unique circumstances, and unique challenges. And if you’re new to the podcast, and you’re wondering if you’ve listened to enough episodes to make it worthwhile, you should still definitely come. You will not be lost, or behind, or unsure about what to do. And if you’re a long time listener of the podcast, and you’re wondering if you’re going to know everything already, then trust me, there is still so much more to learn and apply to yourself. I often, you know we think, “Well, I’ve already gotten such great results, like, how much better could they really be?” A lot better. Just try me, okay. So you honestly should be looking at attending this event as a complete no brainer, because of all the progress you’re gonna make in just one day. Here’s the thing. I know you, and I know you think that because you’re a doctor nobody really gets what your life is like, and what you’re going through, but you know as a listener of this podcast that I do. I get you. I am the person who can actually help you make forward progress on this weight issue. The cost for the day is $597, which is an absolute bargain for what you are getting. You are gonna come out of this day changed for the better, refocused on what matters, so that you can make some real progress this summer. Instead of just eating all the ice cream, and BBQ, and snacks in the doctor’s lounge, and drinking all the drinks that you always do in the summer, and then being worse off this fall than you are right now. You can bring your family for a fun holiday weekend, only if you want to of course, I mean you definitely don’t have to bring them if you don’t want to. You can make it a girls’ weekend, or you can just take it as a getaway for yourself, which you know you desperately need. There’s really something to be said for taking a moment, a couple of days for yourself, to just be with yourself and focus on the things that are most important for you. So, ticket sales close tonight, okay. Go to KatrinaUbellMD.com/live, L-I-V-E, to get your ticket, you know it is going to be so epic. So grab your ticket and join me for this fabulous day. Again, KatrinaUbellMD.com/live. All right, so I wanna talk to you today about how to get the most out of this podcast. And not only this podcast, but all of the information that you’re taking in. So, I’ve had 116 episodes before this episode that you can listen to, and I know many of you have told me, “Oh my gosh I took a long road trip, and I just like binge listened to everything, and it’s been amazing,” and I think that is great. And we really can make some progress in our lives by doing that, but it’s so easy to also zone out, or daydream, or not fully pay attention, when you think that what I’m talking about isn’t applicable to you. And this really, again, goes along the lines of anything that you’re taking in. Whether it’s my podcast, someone else’s podcast, whether it’s a book that you’re reading, an audio book that you are listening to, any kind of documentary that you might be watching, or some sort of other YouTube video or something on some sort of personal growth topic. Even when you’re doing your continuing medical education work. So often we think of it just as this slog that we have to get through, and what I’m about to talk to you about even applies to that. So I want you to really pay attention today, and think about what I’m telling you, because when you have this many episodes under your belt, I really wanna make sure that you are getting the best possible results from listening to this that you possibly can. And I know that some of you think that certain topics that I talk about don’t apply to you, or maybe that the examples I give don’t apply to you, and you think, “Well, that’s too basic, I’ve got real issues in my life.” Or, the opposite, “Wow, that seems like a really heavy topic, the stuff I’m struggling with seems kind of dumb in comparison to that.” None of that even matters. But it totally does. Whatever someone is being coached on, or whatever I’m teaching you, will always apply to your life in some way, shape, or form. You just have to allow your brain to show it to you. So, that’s what I’m going to be teaching you today, it’s just a few short steps to help you to get the very most out of this. You’re getting such amazing free content, why wouldn’t you want to get the absolute best results you possibly could out of this, right? Totally makes sense. So with a podcast, I just wanna say, or an audio book, or anything like that, sometimes you just wanna be entertained. And I do understand that, that is not a problem at all, I definitely listen to podcast for the purpose of entertainment, I’m not really looking for any kind of meaningful change, I just wanna listen to something entertaining. And if that is the way you’re approaching this podcast, then totally fine, I’m not saying that’s wrong or bad by any stretch. But I’m under the assumption that the vast majority of people listening to this podcast really do want to make a change. They really do want to improve some aspect of their lives, not even everybody I know, even wants to lose weight, and that’s okay too, but regardless, even when I’m talking about weight loss, you can get something out of it, if you’re setting your mind properly toward figuring out what that is. So, if you really wanna make that real change in your life, I wanna suggest that the next steps that I’m gonna teach you would be very useful for you to approach this podcast. Okay, so the first thing I want you to do is to ask yourself, why am I choosing to listen to this podcast? Like, what am I wanting to get out of this? What is the purpose of me listening to this podcast? Why did I choose this one? And I think for a lot of you, the answer will be something along the lines of, I understand your specific struggles. I really get what your life is like when almost nobody else does, as a doctor. I know what’s going on in your head, and I’m the one who knows how to help you to change that, so that it actually serves you. So that you’re living that life that you want. That life that you always dreamed of when you were doing your training, and now that you’re out in attending life, you’re like, “I don’t know, this isn’t as good as I thought it was gonna be.” I know what it’s like to be a doctor, which is why I can help you lose weight. Or maybe there’s some other reason. Maybe you’re choosing to listen to this podcast because your doctor told you to listen to it. Maybe your friend is a doctor, or a family member’s a doctor, and said, “Hey, I love this podcast, you should really listen to it too.” But more so than that, what are you hoping to get out of it? Be really clear on that. What you’re doing is, you’re creating your intention before you start listening, rather than just like, “Oh, I thought I would just put something on.” Why are you putting me on? Why is this podcast on, or any other podcast, or audio book? Then, number two, how does this topic apply to me? How is this exact thing showing up in my life? Now, you might need to listen for a time, or to the whole episode, before you have the answer to that. But while you’re even listening to it, I want you to think about how that topic is showing up in your life. How is the exact thing that I’m talking about an issue for you? How does it apply to you? Even if the examples that I give have nothing to do with you and your life, even if you’re like, “I don’t even know what she’s talking about,” you can still be thinking, “How can I apply this topic to myself? Where is this showing up?” You don’t have to wait until I describe your situation perfectly for you to get something really meaningful out of each episode, and if you can’t see it playing out in your life at all, see if you can think of someone you know who’s got that issue going on. And think about how what I’m teaching you would apply to them. Now, I am not saying that you should think about that and then go talk to them, and tell them what you came up with, and try to coach them. We never wanna coach anybody against their own will, without them asking us first, but sometimes we hear something, if we can see it playing out in someone else’s life first, then it’s that much easier for us to see it playing out in our own lives. I know for myself, I sometimes watch somebody being coached on a specific issue multiple, multiple times, and I didn’t think it applied to me, and I didn’t think it applied to me. And then one day, somehow it was slightly different in the way that I heard it, and boom, I was like, oh my gosh. I totally do that too. I could not see it before. And when you start being really distracted, and kind of half listening, then your brain starts thinking, this is how I just approach all of the coaching. Like if it’s not me on the hot seat actually being coached, then eh, I can kind of like, use this other stuff as entertainment. And you can do that, but you will just limit the progress you are making so much, because you’re not actually staying focused and really paying attention. It’s kind of like if you went into a classroom setting, and you’re back in medical school or something, and you were just totally distracted. I’m so glad I didn’t have a smartphone back in those days. It would’ve been so easy, when it felt boring, to just distract myself with Facebook, or Instagram, or emailing people or whatever. Texting people back and forth, making comments. I mean it was hard enough to stay focused some times, and so what happens then when you’re not focused is, “Well shoot, I didn’t get what the instructor was wanting to teach, so are there some notes that I can get, can I borrow someone else’s notes, is there something in our textbook that I can read, or some other resource?” Like, you make the process so much more difficult and longer for yourself, because you’re not actually just paying attention the first time. Then number three. Once you see how it’s showing up in your life, I want you to think about how you can take actionable steps moving forward in your life on this issue. So what we do is, we’re gonna be like, “Oh, my gosh, yeah, I totally do that too. I totally do that too. Oh, yes I can see that. Oh I definitely wanna fix that.” And then we just basically don’t do anything. I was actually just coaching a client last night about it, and she was like, “I totally just vow to make a change, and then the next day I’m doing the same thing.” And I was telling her that the vow was just basically an expression of dissatisfaction with what she’s doing. But then she’s not actually making a plan. She’s not creating actionable steps, she’s not actually learning from what happened, so that moving forward she can do something different and try to figure out a solution for herself. So once you’ve listened to this, don’t immediately go to the next episode, don’t immediately switch to a different podcast, don’t immediately turn on the radio, or an audio book. Take a moment and think, “How will I show up differently now?” So many of you listen in the car I know, so you’re not gonna be able to like, talk, but even if something really impactful comes to your mind, you can just, on your phone, do the voice memo app, and just talk to yourself. And you can write it down later if you need to. But whatever breakthroughs you’re having, you can still record those for yourself even if you’re driving. So, how will you show up differently, where do you need to spend some more time thinking about this further? Sometimes we need a moment, like it doesn’t come to us immediately. We need to kind of hash things out, so are you going to work through this on your own? How are you going to take those steps? So, turn off the external input, and really think about it. Like, maybe if you usually listen to a podcast while you’re cleaning up the kitchen or something like that, don’t immediately go into the next podcast, spend another five or ten minutes completing your task, and also think about this. I will do this often when I’m in the shower, or when I’m getting ready, my brain’ll be like, “I wanna be entertained, let’s turn something on!” But I know I’ve got something that I want to work through, and so then I refuse to basically buffer with more information. That’s what a lot of you are doing. You’re basically neutralizing your negative emotions by going like, “Oh, yeah, I’ve got that too, this is so amazing. What’s the next amazing thing? Let me listen to something else that’s gonna be amazing.” But you’re not actually doing the hard work of applying it to your life. So let your brain wrestle with itself to come up with solutions, ’cause sometimes that’s seriously what happens. That’s happened to me sometimes, where my brain’s like, “No, there’s no possible way. There just isn’t a way!” And I’m like, “No, you gotta keep thinking about it. Stay focused on solutions. What is the solution here? There’s no solution? No, I’m gonna keep thinking about it.” And then boom, I get it. I get that solution, because I allowed myself to stay within the wrestle, and not immediately want to just neutralize it by listening to something else or avoiding it. So keep your brain focused on the solutions. Don’t accept from your brain, “I don’t know,” or, “There’s no way,” or, “I have an exception in my life.” Ask yourself these questions. Turn it around. “But if there was a way. If I did know. If someone else were in this situation, what might they do?” Sometimes we can think about it for someone else, like you can think about with me. “If I were Katrina, what might she do,” to be able to come up with what that solution is. What would the next thing be that you could try? And then, once you’ve worked through this on your own, and you’ve done some work on it, this is step number four, listen to the episode again. Re-listening is gonna be way better and more impactful for you than trying to find another podcast to supplement. I’ve heard that often with my clients, they’re like, “What other podcasts can I listen to? I listened to all of your episodes.” Now, I’m not saying you can’t listen to other podcasts. What I’m saying is, just make sure that you’re not abandoning the work that you’ve just started by just starting some other work with someone else. Like, make sure that you’re spending the time really getting deep and getting out of this what you can. ‘Cause otherwise all you’re doing is just looking for another dopamine hit from the newness of the new material from another podcast. So you’re going to go back, listen to the episode again, and think about, now, from a different place where you’ve done more work on this, how does it apply now? Is there some other area in your life where you actually could be applying the same work? Was there something that I said that didn’t quite resonate the first time, or maybe you didn’t even hear it ’cause you were a little distracted changing lanes or something for that one moment. Just don’t underestimate how powerful it is to listen again and again. You don’t have to do that with every single episode necessarily, but definitely on certain ones that you know you have a problem with that issue, and you wanna make progress on it. ‘Cause otherwise if you’re just spending this time hopping from episode, to episode, to episode, and not doing this work on yourself, you’re really not going deep with yourself. And knowing how to do that, developing that skill, is so important. If you just stay very shallow and surface level with yourself, you’re just scratching the surface of what this work can do for you. I find this all the time with my clients, where they’re like, “I know you always say that we have to do this, and now I think I’m finally getting it.” I love it when they tell me they’re like, “I kind of was doubtful. I didn’t think it really made sense. But now that I’m actually doing it, I see what you’re saying. You’re actually right. Sometimes I’m like, “Listen, you have to trust me to know what you need, okay?” ‘Cause I get what that’s like, where like, “I don’t know,” you know, us skeptical doctors. We’re really just like, “I don’t know, is this worth my time? Is this really worth doing it?” But I want to suggest that you just try it with one episode, and ask yourself, why am I choosing to listen to this podcast? What am I gonna get out of this? What do I want to get out of this? What is my intention in listening to this podcast? Then start listening. “How does this topic apply to me? How is this exact thing that Katrina’s talking about showing up in my life? Where am I struggling with this? Where is this something that, even if it’s not like a child that I’m dealing with, and she’s talking about children, well, but I get that because I have employees that I deal with.” Or, “Sometimes I take care of my nieces and nephews.” Or, “I sometimes find myself acting like a child and having that same tantrum that she’s talking about.” Think about how it’s really playing out in your life. When I’m teaching you these concepts, this is the exact same thing. It’s not like, “Oh, yeah, yeah, I heard that already, she already talked about that, I already know about that.” There’s so much more that you can apply to your life, and I don’t want you to miss out on that opportunity, which is why I created this whole podcast to help you to learn how to get the absolute most that you possibly can out of this podcast. And, if you are interested in actually working with me personally to help you take this to that deeper level, or to know what it’s like to take it to a deeper level with yourself, so that you can go home actually understanding these concepts even better, and taking everything I’ve taught in this podcast, and what I’m going to continue to teach you in future podcasts to that deeper level to your self, please consider coming to my podcast live event on May 25th. As I said, tickets are on sale but only through tonight, so you need to sign up today. KatrinaUbellMD.com/live, is how you can sign up. L-I-V-E, you will not wanna miss it, this is going to change your life whether you’ve worked with me in the past, whether you wanna work with me in the future, whether you’re currently working with me, this is gonna be super helpful and amazing for everybody. So I can’t wait to see you there, definitely go grab your ticket, and I will talk to you next week. Have a great one you guys! Take care, bye-bye. First of all, I am not a doctor. I am a retired registered nurse. I originally saw your weight loss program on my nursing site. I clicked on it to see what you had to say about weight loss. I have been losing weight on my own and am down to 134 pounds. A year ago I had shortness of breath and thought I was having a reaction to my B/P med. Turns out I needed a stent placed in my LAD. That is when I got serious about losing weight. Best motivation ever. I walk at least 6 days a week. I do physical labor (raking yard, mowing, tending my plants, remodeling house. ( scraping popcorn ceilings and painting ). My biggest change is that I do not bake anything any more and do not really miss it. I am 69 years old . You talk about food diary/ tracking but not restricting. Is the purpose of tracking what we eat just to make sure we are following our plan? I can help but to think about calories and about “am I eating too much” instead of cuing into my hunger scale. Yes, you track to be sure you are truly following your plan. Also, it is good to go back and look at if you begin to see a plateau – might help you figure out a trigger food, or too much of something that you need to cut back on, etc.